We took in the Best of the Best Elite Florida Showcase this past Saturday at the Cooper Palm Sportsplex in Apopka. After a long August layoff, it was good to get back in the gym to see how some prospects have developed and to get some new names to keep tabs on for the future. 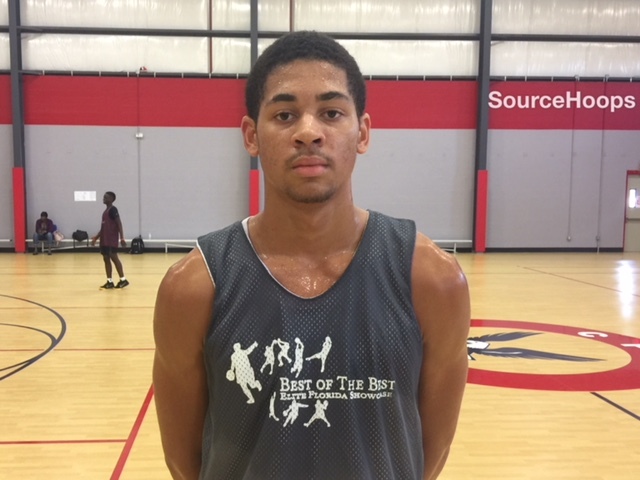 Michael Phillips, a 6’7 forward in the Class of 2020 out of Creekside near St. Augustine gets our vote as top player at the event. While he may not be super-athletic, extra-lengthy, or uber-skilled, Phillips IS super-productive and super-passionate, both on the floor and on the bench. He’s very verbal on the defensive end, directing traffic when defending near the basket, calling out ball screens, and letting on-ball defenders know where the help is coming from. Phillips was quick to challenge shots and pick up ball-handlers that have beaten their defender into the lane. Offensively, he scores pretty well with either hand around the basket, consistently pursues offensive rebounds, and if given a path to the basket will score after two or three dribbles. In the two games we watched Phillips play, he had 16 points and 12 rebounds in game one and 22 points and 18 rebounds in game two. When on the bench, Phillips is no less vocal as he continually cheers on teammates and hollers defensive instructions. Sure his perimeter skills can use an upgrade, but with two years left of high school there is time for that. If Phillips was “Mr. Inside” of the event, then Jacob Crews of Clearwater Superior Collegiate was “Mr. Outside”. The 6’7 rising junior connected on five of six shots from beyond the three point line. He’s got a quick release and with his feet set the shot has a high probability of going down. Despite playing on a tender achilles, Crews continued to work the glass and run the floor. He’s a better than expected athlete and will finish above the rim when given the opportunity. Defensively, he’s alert for weak passes into his area and looks quickly to advance the ball, either via the pass or dribble. Crews has played at a small Class 1A school for the past couple of years and moving up to Superior Collegiate and the SIAA will be a big challenge. It will be interesting see how he responds. Another Superior Collegiate product, 6’5 wing Rob Hardy, was also impressive at the event. A rising senior, Hardy is quite thin but offsets that with a lot of bounce and quickness. As one would expect, he’s at his best when getting out in transition, finishing well above the rim with flair. Hardy has a quick first step when driving to the basket but sometimes struggles to finish in traffic thru contact due to his slight frame. Despite a somewhat flat jump shot, Hardy makes it work, as he knocked down four shots in succession from behind the three point arc during one contest. He has all the physical tools needed to be an effective defender: length, lateral quickness, and anticipation. At this point, Hardy may be best suited for a JUCO stint to shore up his academics, but that may be best for him on the long run. We did not get much of a look at Apopka’s 6’7 rising junior Zach Anderson this past travel season. By all accounts he played well for E1T1’s 16U unit. On Saturday, Anderson showed that he’s worthy of the buzz surrounding his potential. Combining his size and wing span with a skill set that allows him to produce inside as well as out, he’s a tough match up at both ends of the court. More scorer than shooter on the offensive end, Anderson finds ways to get the ball in the basket, usually via drives from the wing or putting back teammate’s misses. He covers a lot of ground quickly on the defensive end and is an effective shot blocker coming over from the weak side. When his perimeter shot starts falling more consistently out to the three point line, Anderson’s stock should elevate even further. Bryce Brown, a 6’0 junior guard out of St. Pete Gibbs, had some good moments on Saturday. Strong and solidly built, Brown found success driving the ball to the basket and challenging defenders at the rim. If the ball didn’t go down, he more often than not earned a trip to the free throw line. Later in the contest, as defenders were playing him for the drive, he pulled up from beyond the arc and knocked down a trio of shots in succession. Defensively, he uses his strength well to keep his opponent from getting to their spot. He and Tre Gilliam should make for a potent backcourt for Gibbs this coming season.